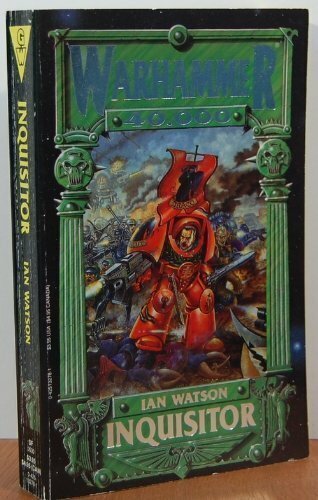 1er Tome de la trilogie "The Inquisition War"
For ten thousand years the Inquisition has been united in a secret war against humanity's worst enemies - heretics, aliens and daemons. 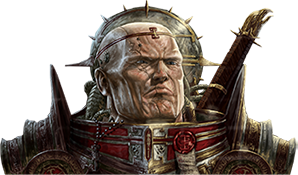 But when an alien-influenced rebellion threatens to enslave mankind, the Inquisition turns on itself in a war that threatens to rip apart the very fabric of the Imperium. Depuis dix mille ans, l'Inquisition a été uni dans une guerre secrète contre les pires ennemis de l'Humanité, les hérétiques, les xénos et les Daemons. Mais quand une rébellion influencé par des xénos menace d'asservir l'Humanité, l'Inquisition s'engage dans une guerre qui menace de déchirer l'essence même de l'Imperium. Jaq promptly consulted the eye-screen. Several spy-flies were tailing Meh’Lindi. She was on a balcony level of an arcade which must specialise in manufacturing small components, and was still doing so. Baggy women and runty, raggy children slaved alongside their menfolk in a veritable honeycomb of family workshops, tier upon tier of plasteel caves linked by ladders and gantries. Swarf from lathes lay thick on the floor below. Wading through this, apace: a man taller than any of the artisans. He wore a pastel-hued cloak and cockaded purple hat quite out of keeping with his surroundings. He attracted whistles and jeers and minor missiles, such as nuts and bolts. Meh’Lindi’s rented, streetwise duo guaranteed her much more anonymity; as to her motives, they exhibited no interest whatever. Jaq had willed a spy-fly to home on the man, whose face he recognized from the Tarot card. Thus, while Meh’Lindi padded in pursuit with her mute chaperones, Jaq was also tracking the Harlequin man. At the Kefalov station the dandified fellow had boarded the transjungle transport, while Meh’Lindi stayed. The accompanying spy-fly clung to the ceiling of the carriage, surveying the Harlequin man until the train carried the spy-fly beyond its transmitting range. Until then, its quarry sat twiddling his thumbs and not quite smirking. Jaq knew that he must give chase; he was virtually being challenged to do so. The Harlequin man had invaded Jaq’s Imperial Tarot with the slickness of a lashworm snatching some flesh from a passer-by, and now that damned individual was contemptuously trailing his cloak for Jaq to follow. This, Jaq did not care for one little bit. Yet to ignore such provocation would surely be a greater folly than heeding it. Leaving Googol to safeguard their equipment, he had hurried with Grimm to the station to meet up with Meh ’Lindi . Je croise les doigts pour que cette trilogie parvienne un jour dans le Segmentum Francia!! Oui prions l'Empereur pour que cette trilogie vienne en France. La date d'édition originale du premier roman de cette trilogie date d'août 2002 ! C'est franchement pas une nouveauté et je ne crois plus à une possible traduction française de cette œuvre. Merci quand même pour sa présentation. Va falloir que je songe à mettre en place une sous-section consacrée aux anciennes publications inédites de la Black Library (et de Games Workshop). Deuxième tome de la Trilogie " The Inquisition War"
We follows the struggles of renegade Inquisitor Jaq Draco against the shadowy figures conspiring to enslave mankind. 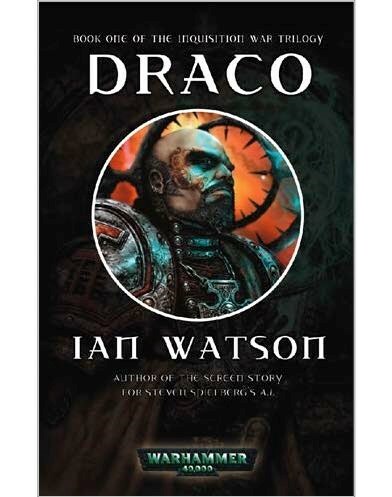 With a half-mad navigator and a lethal assassin at his side, Draco must fight to save the forces, which have branded him a heretic. Nous suivons les luttes de l'Inquisiteur renégat Jaq Draco contre les sombres complots visant à asservir l'humanité. Avec un navigateur à moitié fou et un dangereux assassin à ses côtés, Draco doit se battre pour sauver ceux qui ont fait de lui un hérétique. JAQ RAN ALONG the so-called Lane of Loveliness of Caput City, boltgun in one hand and force rod in the other. This particular boltgun was plated with iridescent blue titanium inlaid with silver runes. The force rod was virtually unadorned, a solid black flute embedded with a few enigmatic circuits. The force rod was for use against whatever spawn of Chaos he encountered, to augment his psychic attack. The rowdy boltgun was for use right now – against a trio of cultists who darted from cover amongst giant broken potsherds which were the remains of one of the glazed ceramic buildings. The cultists’ eyes were glazed with frenzy. One fired a stub gun inaccurately. Bullets from the slugger pinged off a nearby wall of glazed terracotta. The second cultist was swinging a chainsword two-handed. Obviously he was unfamiliar with the weapon. The sword buzzed furiously as its razor-edged teeth spun round, cutting empty air. The third of the cultists was a burly muscular brute. From a hand flamer gushed a narrow cone of burning fuel. Heat scorched Jaq’s face, but none of the fiery droplets had touched him. Such a flamer was too compact a weapon to be worth firing from a distance, nor could its reservoir hold much pressurized fuel. Each blazing aerosol jet was spectacular but it extinguished quickly. You had to be close to your target. Jaq ’s bolter yakkered. Several bolts erupted in the body of the flamer wielder. It was as though the man had been booby-trapped internally with packets of explosive. These now detonated. For a moment the cultist quivered like jelly.The muscle-bound envelope of his body actually seemed to contain the shock wave s. Abruptly he burst apart, gutted thoroughly and bloodily. A bolt from Jaq’s gun caromed off a great glazed potsherd, winging skyward into the haze of smoke which drifted across the city front fires. Subsequent bolts tore the gunman apart, then the swordsman too. Jaq sniffed the sharp nitric aftermath of propellant which had ignited after each bolt flew from the muzzle. Yes, noisy. Yet with hardly any recoil. RAAARK, the gun would utter with each squeeze of the trigger. It hardly bucked at all in one’s hand. With a plosive pop it would ejaculate a bolt. With a flaring swish, that bolt would ignite and accelerate away. Then there would come the thud of impact, followed by the blast of detonation. Oui c'est une ancienne trilogie mais bon je pensais que c'était une bonne idée qu'elle ait son propre sujet. Trés bonne idée de l'avoir mis ici. Je connaissais pas, merci Uriel, maintenant comme tu dis croisons les doigts pour qu'ils arrivent en France un jour malgré leur vieillesse. S'ils sont mis en Print on Demand sur le site UK on peut toujours envisagé une traduction et une sortie chez nous. Chapitre final de la trilogie " The Inquisition War"
Jaq Draco riskis everything for his comrades - even if it means surrendering his very soul to the evil he has sworn to destroy. Jaq Draco risque tout pour ses camarades, même si cela signifie abandonner son âme au démon qu'il a juré de détruire. A WILD REGION of a southerly continent of the planet Karesh consisted of boulder-strewn goat pastures. Beneath those rugged pastures were limestone caverns. In a certain cavern was an exit from the webway. Below ground, phosphorescent lichens flourished. From the other side of the cavern the misty blue glow of the webway might have seemed to the casual eye to be merely a more intense patch of natural luminosity. Thus was the terminus camouflaged. In any case, why should anyone have come down from the surface to search? Such caverns were huge and spooky and dark. Idle curiosity was rarely wise. Evidently some goatherd had intruded at one time or other. Maybe he had been searching for one of his animals which fell down a shaft or strayed too far into a cave. Facing the opening to the webway was a cairn consisting of three billygoat skulls. The horns poked defensively at the blue tunnel, as though to impale whatever might emerge. The skull-cairn implied that the locals were primitive folk. Lex suggested re-entering the webway to find a more advanced world. Jaq was still deep in shock at Meh’lindi’s death, and felt unable to make a decision. Lex and Grimm debated the issue. To re-enter the webway would be to take such a random risk. They needed food and drink and rest. They had to hide. They had to think. In their hands was an alien Book of Fate – written in inscrutable script in a language which none of them knew, not now that she was dead.The book was a key to so many secrets. This business of the Emperor’s Sons, for instance! Since the book supposedly contained prophesies about the final apocalypse, there must be details about those Sons in this book – if the Sons genuinely existed. One only had a Harlequin’s word for this, and Zephro Carnelian’s too. Both parties could have been lying. This book was the proof. The proof couldn’t be read. Such as… a master of this Book of Fate? Such as… someone who had undergone daemonic possession, and redeemed himself? ‘You’re still in trauma,’ Lex told Jaq sternly at the mere mention of such matters. ‘I shall pray for clarity,’ said Jaq numbly. He didn’t pray. ‘Listen,’ said Grimm, ‘I once visited a farming moon so superstitious that even wheels were banned. ’Cos wheels represented godless science. Perils of witchcraft, hmm? Even on that moon there were anti-grav floaters and a swanky capital equipped with a spaceport. Quel dommage pour la non traduction. Surtout s'il ne le traduise pas à cause de quelques éléments du fluff, car je suis sûr que cela reste une bonne épopée. Administration a écrit: La date d'édition originale du premier roman de cette trilogie date d'août 2002 ! Voilà, on en parle beaucoup mais peu de gens l’ont vraiment lu en fait…. 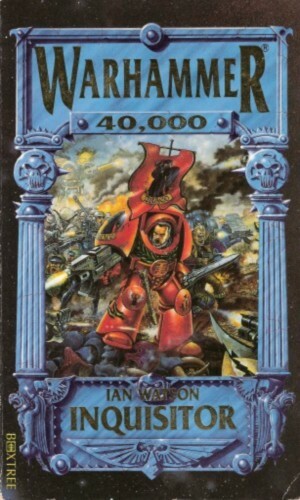 La première édition de cette trilogie ne date pas du tout de 2002, mais a été écrite entre 1990 et 1995 par Ian Watson, ce qui fait d'elle la toute première série qui traite de l’Inquisition et de wh40k. Le tome 1 « Inquisitor » date de 1990 et sera même le tout premier roman GW sur 40k et date même d’avant la création de la Black Library. J’avais acheté cette trilogie à cette époque chez Descartes conscient de tenir là, le saint Graal. A présent, elle est introuvable, la BL l’avait en effet réédité en 2002 sous le titre The Inquisition War pour info dans une version réécrite et totalement remaniée et ressortie en 2011 en ebook. Ayant la version originale de 1990, je ne vous parlerai pas de celle de 2002. Voici le livre et sa couv’ d’origine éditée par Boxtree. 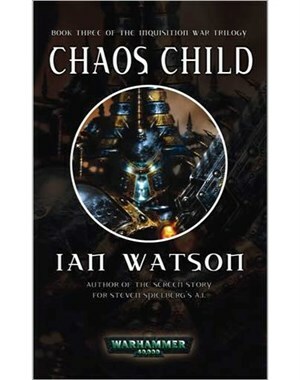 Ian Watson est un journaliste, auteur de SF réputé en Angleterre pour sa qualité d’écriture. On le voit au travers de ses romans. Le niveau d’anglais est soutenu, nettement moins grand public que certaines publications de la BL (hors Abnett et McNeill) et la connaissance du fluff si particulier de 40k est parfaite. Watson fait figure d’ovni dans le paysage commercial de GW, cette trilogie restera unique car figée dans la V1. Pour certains, Watson est peut-être un des auteurs qui a le mieux saisi l’essence même de l’univers sombre de 40k. Pour, moi, qui l’ai lu et relu, c’est incontestablement un des meilleurs auteurs. C'est lui qui fera passer cet univers de space op' au Dark goth. Ici, pas de happy end, juste une éternité de damnation. Et là, Watson fait mouche. On est pile dedans. Si on ne prend pas cet élément en compte et qu’on s’attend à du Abnett, on passe totalement à côté de l’histoire. Pour ceux qui ne lisent pas l’anglais ou qui souhaitent tout simplement savoir de quoi parle vraiment cette mythique trilogie, je vous fait un (long) résumé ici en tâchant de rester impartial afin que vous vous fassiez votre propre opinion. J’aurais aimé faire court, mais c’est très difficile de tout caser en si peu de mots. Donc tout ce qui est ici est plus pour l’histoire et le fun qu’autre chose car les livres ne sortiront plus…. (enfin, sauf la nouvelle version en ebook) et en tout cas, pas en français. 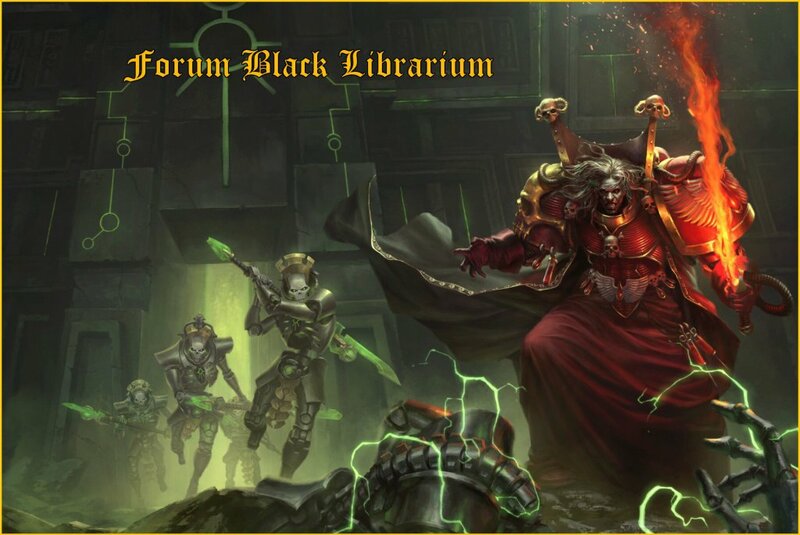 A noter que de nombreux thèmes et vocabulaire de wh40k voient leur apparition ici même dans cette trilogie (lumiglobe, temple callidus, l'Exterminatus, mouche-pix, schola progenium, la navis nobilite, etc). Le codex assassins n’existait pas à l’époque, il a été écrit à partir de cette trilogie par exemple, tout comme le fluff et le 3ème oeil des navigators que l’on doit à l’auteur . Cette série continue toujours d’inspirer les développeurs plus de vingt ans après, même si ils ne l’avouent pas vraiment car cette trilogie est très marquée V1. C’est malgré tout une référence qui inspirera même le grand Abnett. L’Inquisiteur Jaq Draco est un inquisiteur de l’Ordo Malleus, il a 35 ans, assez physique, brun avec un petit bouc, il ressemble en fait à Sean Connery dans le Nom de la Rose (en un peu plus jeune). C’est un psyker qui parvient à projeter des auras de protection ou de dissimulation autour de lui ou de son entourage. Ancien Progenium, ses parents étaient adeptes et furent tués par des mutants sur Xerxes Quintus son monde natal. Ses pouvoirs psychiques apparurent alors qu’il était à peine adolescent. Son Abbé Instructeur le recommanda alors pour les Vaisseaux-Noirs. Son incroyable aptitude lui permit de survivre aux tests et d’être formé à la Scholastica Psykana. Rapidement, il fut repéré par l’Inquisition qui entreprit de le former. Draco est très pieux et puritain (au départ), il se bat an général avec un bâton de force et un pistolet bolter. Il possède son propre vaisseau, une nef gothique du nom de Tormentum Malorum dont l’intérieur est entièrement plaqué de dalles d’obsidienne, décorées d’électrochandelles et de bas reliefs inspirés de la vie des Saints et de l’Empereur. Meh’Lindi : une assassin Callidus issue d’un monde sauvage où les shamans sont des « changeurs de formes ». Grande, athlétique, belle et sauvage, elle a les cheveux noirs coupés courts et les yeux dorés. Comme toutes les Callidus, elle est un véritable caméléon. L’emploi de la drogue Polymorphine et son entrainement lui permettent de changer d’apparence. Mais Meh’Lindi est unique, elle a subit une modification très spéciale au sein de son temple, (On parlerait désormais d’une expérience radicale) car elle a subi de lourde modifications génétiques pour ne plus se transformer qu’en hybride genestealer (voir la nouvelle Alien Best Within du même auteur dans le recueil Deathwing). Hybride incomplet, mais hybride tout de même. Draco le sait et c’est pour cette raison qu’elle l’accompagne lors de leur première mission. Meh’lindi est une arme vivante qui peut tuer à main nue. Elle ne s’encombre que rarement d’armes en dehors de ses armes digitales, de lames ou d’armes à aiguilles. Le deuxième compagnon est un Squat du nom de Grimm. Agé de 145 ans, c’est encore un jeune Squat à la barbe rousse tressée et aux connaissances techniques hors du commun comme tous ceux de son espèce. Il est toujours à faire des traits d’esprit parfois irrésistibles, voire même volontiers cyniques, ce qui énerve souvent le puritanisme de Draco qui n’hésite pas à le rabaisser à sa condition d’abhumain. Excellent pilote et technicien, Grimm se bat en général avec tout un panel d’armes, du pistolet laser au fusil à plasma en passant par le bolter. Le troisième compagnon est Vitali Googol, un Navigator poète, flegmatique et romantique qui n’hésite pas à composer des poèmes surtout pour Me’lindi dont il est amoureux. Ce qui n’est pas réciproque et ce qui vaut les moqueries du petit abhumain qui tente souvent de voler la vedette au Navigator. Cette petite équipe haute en couleur se rend donc sur le monde ruche de Stalinvast. Draco reçoit cet ordre de son Seigneur Inquisiteur : Baal Firenze, avec pour consigne de trouver quelque chose que les autres n’auraient pas vu…Ce qui laisse Draco perplexe, s’attendant à trouver un démon ou quelque chose dans le genre. Stalinvast est actuellement en plein conflit. Un soulèvement d’une secte genestealers est en train d’être réprimé par la force et par la poigne de fer d’un Inquisiteur exubérant du nom de Harq Obispal. Ce dernier aidé des FDP, dirige un véritable raid sur les ruches contaminées, écrasant tout sur son passage, civils et innocents compris. Ce qui est à l’opposé des méthodes discrètes de Draco. Ce dernier, sous l’apparence d’un Libre-Marchand loue une suite dans un grand hôtel de la ruche principale. Meh’Lindi joue le rôle de sa concubine, Grimm et Googol jouent leur propre rôle. Draco possède un artefact : des Mouches-Pix (nanodrones repris récemment d'ailleurs dans le jeu Dark Heresy)avec vue à multifacette sur un écran pix portatif, la technologie est décrite comme étant d’origine Jokaero par Watson. Grâce aux Mouches-Pix et à son Tarot, Draco découvre qu’il est espionné par un personnage étrange qui cherche à attirer l’attention sur lui. L’homme est traqué par l’équipe alors que Vitali surveille leur suite à l’hôtel. Alors que les combats touchent à leur fin et qu’Hobispal est vu comme un libérateur, Draco et son équipe partent pour la sous-ruche. Ils parviennent à retrouver l’homme mystérieux qui se nomme Zephro Carnelian. Ce dernier est grimé en Arlequin mais c’est un humain. Il leur apprend alors l’existence de l’Hydre, une entité warp en veille qui se trouve dans les bas-fonds de la ruche. Il semble avoir un certain contrôle sur elle et s’en sert d’ailleurs pour les tenir en respect. Meh’lindi attaque mais elle sera vite capturée et maitrisée par l’entité. Carnelian jouera d’ailleurs avec elle, faisant pénétrer les tentacules immatériels de l’Hydre dans l’esprit de Meh’lindi pour l’empêcher d’agir. (on assiste là à une véritable scène de viol psychique telle qu'on ne reverra jamais à la BL !) L’entité a été créée dans le Warp et attend d’être éveillée pour prendre le contrôle total des habitants de la planète. Quand Draco veut en savoir plus, Carnelian relâche Meh’lindi, disparaît et lui conseille de chercher par ses propres moyens. Meh’lindi parvient à prélever un morceau de la créature warp qui l’a violé psychiquement. Elle se sent alors souillée au plus profond d’elle et demande à Jaq la permission de se suicider rituellement, ce qu’il refuse. Il a besoin d’elle plus que jamais. Draco, Grimm et Meh’lindi se rendent ensuite de toute urgence au palais du Gouverneur. Là il demande de réquisitionner son astropathe personnel, une vieille femme noire du nom de Moma Parsheen. Il lui ordonne alors d’envoyer un message codé vers le chapitre space marine le plus proche afin de lancer un ordre d’Exterminatus sur Stalinvast. A peine le message envoyé, Moma Parsheen lui signale qu’elle ressent l’ouverture d’un portail dans la sous-ruche et qu’une puissance psychique est en train de quitter leur monde. Meh’lindi perçoit alors trois de leurs Mouches-Pix qui sont en train de les observer, elle les détruit aussitôt. Elle et Grimm ressentent une présence et se lancent à sa poursuite. Il s’agit de Zephro Carnelian, mais ils arrivent à le perdre dans les couloirs du palais. Draco demande alors à Moma Parsheen d’annuler le message qu’elle vient d’envoyer et de pister psychiquement l’entité. Elle lui répond que c’est trop tard pour l’entité mais pas pour Carnelian, sur qui elle implante un mouchard psychique. Retrouvant Googol ligoté dans la suite de leur hôtel, ils se sont évidemment fait voler leur matériel par Carnelian, dont les fameuses Mouches-Pix. La deuxième partie du roman, emmène Draco et son équipe, accompagnés de la vieille astropathe sur ordre de l’Inquisiteur dans le warp à bord du Tormentum Malorum. Durant le voyage, Meh’lindi et Draco feront l’amour une seule et unique fois, à la demande de Meh’lindi afin de se purifier, dit-elle de ce que Carnelian lui a fait subir sur Stalinvast. A bord, Parsheen avoue à Draco qu’elle lui a menti en lui disant avoir annulé l’ordre d’Exterminatus. Ainsi elle a pu se venger des années de servitude et de souffrance que l’Astra Telepathica lui avait infligé. Draco, furieux se rend compte qu’il est alors responsable de la mort d’un monde et de milliards d’innocents. Parsheen continue de traquer Carnelian, ce qui les amène aux abords de l’œil de la Terreur. Là, ils entrent dans une réalité où le warp remodèle la réalité à sa guise. Ils trouvent finalement le vaisseau de Carnelian, accosté le long d’un Space Hulk à la dérive. Enfilant des combinaisons étanches, ils se rendent à bord pour finalement tomber dans une embuscade. Ils sont capturés. Seul Draco est emmené sous bonne garde devant un étrange conclave. Là il reconnaît Zephro Carnelian, qui tue Parsheen sur le champ. Ils reconnaissent aussi Obispal et son propre supérieur : Baal Firenze. D’autres personnages restent masqués. Il s’agit de l’Ordo Hydra, un conclave secret d’Inquisiteurs et de puissants personnages ultra radicaux qui sont à l’origine du projet Hydre. Ils expliquent leurs plans à Draco car souhaitent le recruter dans leurs rangs. Selon eux, l’Empereur est sur le point d’échouer dans sa lourde tâche (la faute à l’Hérésie, au chaos, au temps qui passe, etc). Il va mourir et il est temps de le remplacer. Ils ont alors entrepris au cours de longs siècles d’études la création d’une entité warp qui pourra se disséminer parmi toute l’humanité et ainsi lier les esprits de chaque humain, éveillant leur potentiel psychique afin de former un esprit unique aux pouvoirs incroyables, capable de balayer la galaxie de toutes les races xenos et même du chaos. Draco est horrifié par ce qu’il entend mais continue de jouer le jeu pour en apprendre un peu plus sur cette sombre cabale d’ultra radicaux. Il accepte de faire partie de leurs membres et doit prêter serment de ne jamais mettre les pieds sur Terra et se fait remettre une souche de l’Hydre, prête à être implantée sur un nouveau monde pour y croitre. Il repart alors avec son équipe et le morceau d’Hydre dans un caisson de stase. A bord du Tormentum Malorum il se confie à Meh’lindi et lui raconte toute cette histoire. Elle lui suggère alors le fait que Carnelian doit être un agent double car c’est lui qui a cherché à les introduire justement dans ce conclave. Bien qu’elle souhaite la mort de Carnelian, elle voit là la possibilité de détruire ce projet de l’intérieur. Draco ne compte alors pas respecter son serment et entreprend de filer droit sur Terra pour en informer l’Empereur. Il pense qu’il va échouer et sera surement tué avant mais son Tarot le guidera finalement après un véritable périple jusqu’au Trône d’Or. (une grand partie décrit notamment Terra et la palais de l’Empereur qui est de la taille d’un continent.). Draco et ses agents mettront des semaines à le parcourir et atteindre le Trône d’Or. Là, l’Empereur lui siphonne le cerveau pour « comprendre » son histoire. On se rend alors compte que l’Empereur est multiple, il parle de plusieurs voix, disant à Draco qu’il ignore tout de ce projet mais que d’un autre côté il est omniscient et sait tout, donc comment pourrait-il ignorer ce projet ? On comprend aussi que l’Empereur lutte et souffre depuis qu’il est enchâssé dans le Trône d’Or et qu’il a du sacrifier son humanité en affrontant Horus. Depuis, son existence n’est plus que tourment, souffrance, amertume et rancœur. Il sait que l’humanité souffre mais il sait que c’est nécessaire même si cela lui fait mal. Son multi-esprit est désormais tout entier tourné vers la vigilance qui maintient l’Imperium, l’Astronomican. Il prévient cependant Draco qu’une partie infime de son multi-esprit va continuer de le guider (par le biais du Tarot). dans le tome 2, donc…. 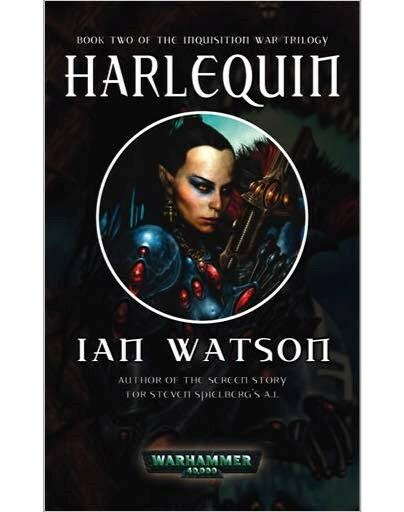 Le tome 2, Harlequin, écrit en 1994 commence un siècle après la fin du tome 1. Jaq Draco a volontairement trahi l’Ordo Hydra et l’inquisition. Il ne peut donc plus se fier à l’une ou à l’autre des parties. Avec son équipe, ils fuient Terra et parcourent plusieurs systèmes, de saut warp en saut warp. Il compte se mettre au vert un certain temps. Avec Meh’lindi et Vitali Googol ils se mettent en stase à bord du Tormentum Malorum pendant un siècle. Grimm de son côté est resté sur un monde lors de leur fuite. L’équipe le retrouve donc et Grimm leur apprend avoir été en contact avec Zephro Carnelian qui cherche justement à impliquer Draco dans cette histoire. Ce dernier lui a alors fait part des plusieurs choses : c’est un Illuminati *, un agent des eldars Arlequins. Leur but est de contrer l’Ordo Hydra. Seulement, d’après les prophètes eldars pour qui il travaille (dont Eldrad Ulthran) Draco est la clé, son nom apparaît même dans le livre du destin, le livre de la Rhana Dandra qui se trouve dans le Bibliothèque Interdite. Sachant cela, Draco veut voir le livre et découvrir ce qu’est cette prophétie dont parlent les eldars et où il est impliqué. Il envisage donc de pénétrer dans le Bibliothèque Interdite. Une guerre civile faisant rage contre des cultistes, Vitali Googol meurt, tué par une démonette sur le monde où ils retrouvent Grimm. Draco recrute alors un nouveau Navigator (Azul Petrov) et un astropathe (Fennix). Les rapports deviants et malsains entre les 2 personnages sont décrits avec brio. (l'astropathe peut "lire" dans l'œil warp du Navigator et en devient complètement accroc même si cela le détruit lentement). Draco décide alors de retrouver celui qui avait modifié le corps de Meh’lindi pour lui retirer ses implants. Une fois chose faite, Meh’lindi, grâce à la drogue Polymorphine, prend l’apparence d’une eldar. Avec l’aide de son Tarot et grâce à la divination de l’Astropathe, Draco trouve un point d’entrée de la Toile eldar, ensemble, ils parviennent à y entrer, leur périple sera semé d’embuches, passant de mondes en mondes et de portails en portails. Ils trouveront notamment l’aide d’un capitaine Imperial Fists, Lexandro d’Arquebus (issu d’un autre roman du même auteur : Space Marines – 1993 (faut que je pense à faire un commentaire dessus aussi) qui se laissera convaincre par l’inquisiteur renégat à propos de la machination de l’Ordo Hydra. Ils arriveront finalement à la Bibliothèque Interdite après moult aventures et après avoir perdu le navigator et l’astropathe dans des combats. Là, Meh’lindi, sous l’apparence d’un guerrier aspect arrivera à berner les eldars pendant un bref instant. Draco trouvera le livre et s’enfuira mais Meh’lindi, découverte, sera finalement massacrée par Jain Zar, une des Seigneurs Phoenix et gardienne de la Bibliothèque. Fou de douleur et ne pouvant plus rien faire, car totalement amoureux d’elle, Draco s’enfuit avec le livre en compagnie de Grimm et de Lexandro le space marine. Il apprend notamment qu’un point de la Toile, appelé la Croisée de l’Inertie est l’endroit où le temps peut s’inverser. En parallèle, on apprend que les eldars Arlequins et les prophètes eldars sont à l’origine du contrôle des Illuminati. La prophétie sur les sensei n’est peut-être qu’une légende inventée de toute pièce par eux dont le but est surtout de contrôler à terme l’esprit vacillant de l’Empereur et ainsi reprendre le contrôle de la galaxie. Ce qui les oppose à l’Ordo Hydra et à ses Illuminati renégats, affranchi du contrôle eldar mais dont la « création » risque d’engendrer une nouvelle sombre divinité. Zephro Carnelian réalise alors que dans tous les cas, l’Humanité risque de perdre. Soit elle est manipulée par les prophètes eldars, soit elle devient un jouet de l’Ordo Hydra et de ses maitres fous. Draco reste son seul espoir. Le tome 3, Chaos Child date de 1995 et débouche sur la lente folie de Draco qui, au lieu de contrer la machination qui se joue de l’Humanité, va se servir du Livre de la Rhana Dandra pour ses propres ambitions. Toujours sur le monde de Saluborb (là où Meh’lindi s’est fait retirée ses implants), Draco capture un jour une voleuse (Rakel) ressemblant un peu à sa callidus, il va la manipuler et préparer un rituel qui invoquera l’âme de sa défunte assassin pour l’incarner dans l’enveloppe charnelle de la malheureuse. Suite à quoi, Draco va invoquer un démon, se faire volontairement posséder puis se faire exorciser, trouver la Croisée de l’Inertie afin de changer la marche du temps et retrouver ainsi Meh’lindi avant qu’elle ne soit tuée pour l’incarner dans le corps de la voleuse. Sa tentative échoue lamentablement, à force de manipuler le warp, il mourra, corrompu et lucide de son erreur, finalement abattu par Lexandro dans la Toile eldar, où son âme restera emprisonnée à la fin, totalement impuissant. Le livre de la Rhana Dandra sera retrouvé par les Arlequins. Seuls Grimm et Lexandro ressortiront de la Toile et partiront sur les traces d’un sensei découvert lors de leur périple. Le point fort du livre : la mort d’un monde, Saluborb qui se retrouve finalement consumé par les énergies warp manipulées par Arhiman et les Thousand Sons. Autre point fort : La description de la Toile eldar et les effets de la corruption sur Draco. [Cet ancien fluff, abandonné pendant 20 ans, refait finalement son apparition aussi dans Atlas Infernal] Les Illuminati sont des humains ayant survécu à une possession démoniaque en bannissant le démon à la seule force de leur esprit. Ces personnages hors du commun sont différents des exorcisés, qui eux l’ont été grâce à une intervention extérieure. Ce qui fait la force des Illuminati est le fait qu’ils soient immunisés aux prédations du chaos. Par contre, leur esprit ou leur corps en est parfois brisé de façon irrévocable. Cette cabale occulte a infiltré tous les rouages de l’Imperium, préparant en secret leur grand plan. Ils connaissent très bien le Warp et ses secrets et n’ignorent pas que l’Empereur est vacillant. Ils ont pour projet de prévoir son remplacement. Leur immunité au chaos les rend précieux aux yeux des eldars qui voient en eux une arme formidable. Les Illuminati ont des connexions avec les Arlequins et accèdent à la Bibliothèque Interdite. Contrôlés en secret par les Grands Prophètes eldars, leur fonction est de trouver et veiller sur les descendants de l’Empereur. Des immortels aux capacités uniques dont l’énergie psychique devrait servir à réincarner l’âme de l’Empereur dans un nouveau corps. Cette cabale est bien entendue totalement hérétique aux yeux de l’Inquisition. Il y a des chances qu’ils aient aussi de fortes connexions avec les Thoriens et les Résurrectionnistes. Merci pour ce long retour sur cette série trop peu connue. On pardonnera ton déterrage de topic (et pourtant j'abhorre cette pratique). Merci pour ce gros résumé sur cette série très passionnante. Mais du coup, c'est juste du copier-coller de VoxLudi ? Je ne sais pas combien de gens d'ici y vont mais perso je l'avais déjà vu, c'est pour ça. Tu as eu raison Illuminati et je devrais penser à le faire un de ces 4 avec les miens. L'essentiel est que ta critique soit argumentée et construite, et cette antiquité de Ian en vaut le coup. Je l'ai commencé mais ai du m'arrêté à cause de l'HH. Rien que pour le Space Dwarf et Mortarion, Inquisitor War reste sur ma TODO liste. - Ghost of Arkio - a écrit: Rien que pour le Space Dwarf et Mortarion, Inquisitor War reste sur ma TODO liste. mais j'ai confondu avec Draigo. Je déterre ce sujet ( pardonnez moi modo ) car je tiens à remercier Illuminati pour ses traductions ( tu as fais le post de la tablette des Anciens où l'on découvre que l'Empereur serait un Ancien , créateur de la Race Humaine ou tout du moins son guide suprême ( Comme quoi la Corée du Nord est dans le juste parfois ^^). Et ce fluff m'a beaucoup inspiré. L'ancienne époque était quand même un niveau au dessus du nouveau pseudo-fluff auxquel j'adhère vraiment moyennement. Mais c'est mon opinion. Une question me tarabiscote : l'Atlas Infernal est il sa suite directe ( avec un auteur différent et une époque différente car 20 ans ont passés ) ? Ian Watson a t'il écrit d'autres livres que Inquisition Wars ?